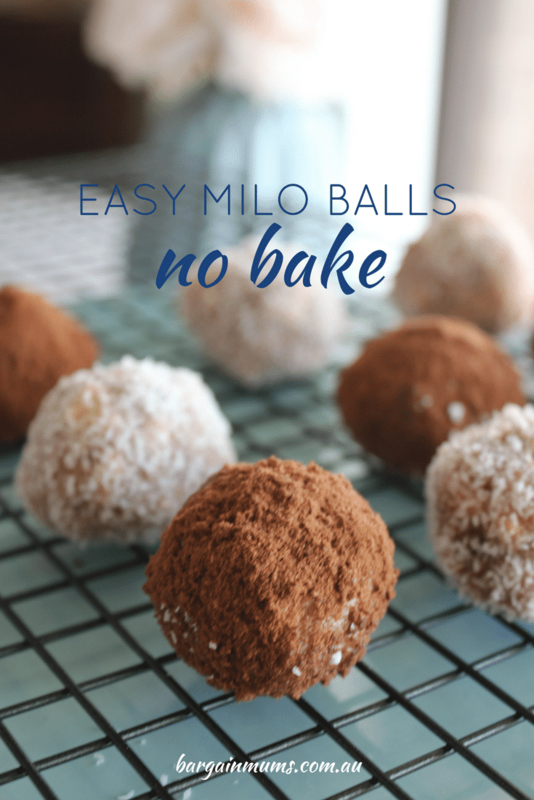 These easy Milo balls are so easy, you can have them made in under 10 minutes. All you need is a packet of plain biscuits (I used Scotch Finger, but any will do), a tin of sweetened condensed milk, desiccated coconut and of course some Milo. Best of all, it’s a no bake recipe! If you love these Milo balls, try one of our other Milo recipes! Our Milo Slice and Milo and Weetbix Slice are two of the most popular recipes on our website. To make these delicious Milo balls, first crush the entire packet of biscuits. You can do this using a food processor if you have one, or by placing in a zip lock bag, and bashing with a rolling pin until crushed. Place the crushed biscuits in a large mixing bowl. Add the tin of sweetened condensed milk, desiccated coconut and Milo to the mixing bowl and mix until well combined. Roll teaspoons full of the mixture into balls and roll in either the extra desiccated coconut or Milo (whichever you decide to use) to coat. Place in an airtight container and place in the fridge or freezer. Crush the biscuits in a food processor, or place in a zip lock bag and bash with a rolling pin until crushed. Transfer to a large mixing bowl. Add the sweetened condensed milk, desiccated coconut and Milo to the mixing bowl and stir until well combined. Place extra desiccated coconut or Milo in a shallow bowl. Roll teaspoons-full of mixture into balls, and roll in the coconut or Milo to coat. Refrigerate or freeze in an airtight container.